It looks like Sharepoint 2013 Search results are not showing little icons that display the file type next to each result, specifically non-Office/non-PDF type docs. File types like ZIP, EML, MHT and some others have icons displayed next to them just fine when loaded into a Document Library, but not as part of a search result set. After checking all the basics, such as making sure docicons.xml file had proper extensions and icons referenced, this looks like a potential product issue. Pretty easily reproducible and I’ve then tried to use IE Developer Tools to see whether an image file is actually being requested when searching for Word Document versus a Zip File. As a quick test, I simply took out the “if” clause and used FileExtension property to workaround. Not sure if it’s the most graceful solution, but at least now every file that has a FileExtension property populated will get an Icon associated with it. This should cover majority of these use-cases such as ZIP, EML, etc. Documents that do not have a defined FileExtension (such as Web pages) will still have missing icons. New crawls would then start and complete without problems, which led us to believe that this had to do with a specific crawl that never completed. We took a guess that perhaps one of the crawls has been in a Paused state, which ended up to be a correct assumption and saved us from writing SQL statements to figure out what state various crawls were in and so on. Once this particular crawl was resumed, Links to Process went down as expected. This process did give me a reason to explore what exactly happens when a crawl starts up and is either Paused or Stopped. The HTTP protocol handler starts by making an HTTP GET request to the URL specified by the content source. If the file is successfully retrieved, a Finder() method will enumerate items-to-be-crawled from the WFE(Web Front-End) and all the links found in each document will be added to the MSSCrawlQueue table. Gathering Manager called msssearch.exe is responsible for that. This is exactly what “Links to Process” metric shows on a graph, it’s the links found in each document but not yet crawled. If there are links still to process, they will be seen by querying the MSSCrawlQueue table. Items actually scheduled to be crawled and waiting on callbacks are also seen in MSSCrawlURL table. This corresponds to “Transactions queued” metric in the graph. Each Crawl Component involved with the crawl will then pull a subset of links from MSSCrawlQueue table and actually attempt to retASTrieve each link from the WFE. These links are removed from the MSSCrawlQueue once each link has been retrieved from a WFE and there is a callback that indicates that this item has now been processed/crawled. Once a specific crawl was set to a Paused state, enumerated items-to-be crawled stayed in MSSCrawlQueue table and were not cleared out, corresponding to “Links to Process” metric in the graph. If instead we attempted to Stop a crawl, these links would have actually be cleared out from the table. This behavior should be similar with Sharepoint 2013 Search. A few days ago a question came up regarding looking at Sharepoint 2013 Search from a security perspective, specifically looking at any file-storage paths where ingested content may be stored, temporarily or permanently. An example is a document that contains Personal Information (PII info) and it’s important to know where this document may be stored on disk for auditing purposes. We are leaving Sharepoint databases out of this example. Before talking about specific file paths, here are some general tidbits on this topic I’ve been able to gather. The SharePoint 2013 Search Service does not encrypt any data. All temporary files are secured by ACLs so that sensitive information on disk is only accessible to the relevant users and Windows services. If the disk is encrypted at OS-level, this is transparent to SharePoint search. It’s important to carefully benchmark indexing and search performance when using OS-level encryption due to performance impact. If you do need to use OS-level disk encryption, please first contact Microsoft support to get the official guidance from the Product Group (if official documentation is not yet available on TechNet). My understanding is that currently only Bitlocker drive encryption will work with Sharepoint 2013 Search. Although both the Journal and index files are compressed, they should be considered readable. Before we get anywhere further with search, let’s discuss in more detail how content is gathered, and that’s via crawling. Crawling is simply a process of gathering documents from various sources/repositories, making sure they obey by various rules and sending them off for further processing to the Content Processing Component. Let’s take a more in-depth look at how Sharepoint crawl works. The MSSearch.exe process is responsible for crawling content from various repositories, such as SharePoint sites, HTTP sites, file shares, Exchange Server and more. When a request is issued to crawl a ‘Content Source’, MSSearch.exe invokes a ‘Filter Daemon’ process called MSSDmn.exe. This loads the required protocol handlers and filters necessary to connect, fetch and parse the content. Another way of defining MSSDmn.exe is that it is a child process of MSSearch.exe and is a hosting process for protocol handlers. The figure above should give you a feel for how Crawl Component operates, it uses MSSearch.exe and MSSDmn.exe to load the necessary protocol handlers and gather documents from various supported repositories, and then sends the crawled content via a Content Plug-In API to the Content Processing Component. There is one temporary location I should mention as listed in the figure(as there is more than one), and that’s a network location where crawler will store document blobs for CPC to pick up. It is a temporary on-disk location based on callbacks received by the crawler Content Plug-In from the indexer. Last part of this architecture is the Crawl Store database. It is used by the Crawler/Gatherer to manage crawl operations and store history, URL, deletes, error data, etc. – Crawler is no longer responsible for parsing and extracting document properties and various other tasks such as linguistic processing as was the case with previous Sharepoint Search versions. Its job is now much closer to FAST for Sharepoint 2010 crawler, where crawler is really just the gatherer of documents that’s tasked with shipping them off to the Content Processing Component for further processing. This also means no more Property Store database. – Crawl component and Crawl DB relationship. As of Sharepoint 2013, crawl component will automatically communicate with all crawl databases if there is more than one(for a single host). Previously, mapping of crawl components to crawl databases resulted in a big difference in database sizes. 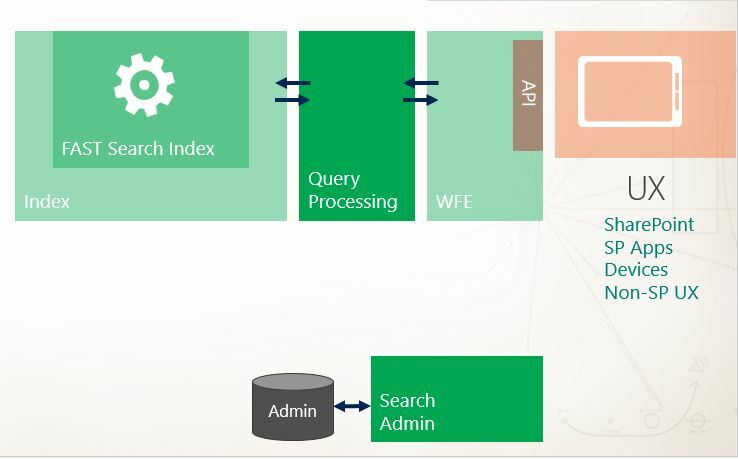 – Coming from FAST for Sharepoint 2010, there is single Search SSA that will handle both content and people crawl. No longer is there a need to have FAST Content SSA to crawl documents and FAST Query SSA to crawl People data. – Crawl Reports. Better clarity from a troubleshooting perspective. • STS3 Protocol Handler: accessing SharePoint Server 2007 sites. • STS4 Protocol Handler: accessing SharePoint Server 2010 and 2013 sites. • SPS3 Protocol Handler: accessing people profiles in SharePoint 2007 and 2010. Note that only STS4 Protocol Handler will crawl SP sites as true Sharepoint sites. If using HTTP protocol handler, Sharepoint sites will still be crawled but only as regular web sites. Full Crawl Mode – Discover and Crawl every possible document on the specific content source. Incremental Crawl Mode – Discover and Crawl only documents that have changed since the last full or incremental crawl. Both are defined on a per-content source basis and sequential and dedicated. This means that they cannot be run in a parallel and that they process changes from the Content Source ‘change log’ in a top-down fashion. This presents the following challenge. Let’s say this is what we expect from an Incremental crawl as far as processing changes and the amount of time it should take. – Each SSA will have only one Continuous Crawl running. – You cannot pause or resume a Continuous crawl, it can only be stopped. – Add crawl components for both tolerance and potentially a better throughput (depending on the use-case). Number of crawl components figures into calculation of how many sessions each crawl component will start with a Content Processing Component. – There is a global setting that allows you to control how many worker threads each crawl component will use to target a host. The default setting is High, which is a change from Sharepoint 2010 Search where this setting was set to Partially Reduced. The reason for the change is that crawler is now by far less resource intensive than in the past due to much of the functionality moving to Content Processing Component. Microsoft support team recommends changing Crawler Impact Rules versus this setting, mainly due to the fact that Crawler Impact Rules are host-based and not global. Partially reduced = Number_of_CPU’s+4, but threads set to ‘low priority’, meaning another thread can make it wait for CPU time. – Crawler Impact Rules: There are not global and are “host”-based. You can either set it to request a different number of simultaneous requests than below or change to have 1 request/thread at a time with a wait time of Y number of seconds. Choosing to have 1 request a time while waiting for a specified time will most likely ensure a pretty slow crawl. We will tackle other search components in future posts, hopefully providing a very clear view of how all these components interact with each other. I’d like to revisit the topics that Leo have so well described in his 2 previous posts titled ”Search 101″ and “Search Architecture in SharePoint 2010″, but discuss those in the context of SharePoint 2013 Search. This post will address general architecture of SharePoint 2013 Search, describe all the components involved and briefly touch upon the biggest changes when coming from FAST for SharePoint 2010 “world”. Future posts will go deeper into each search component and provide both an overview and troubleshooting information. Processing: prepare this content to make it more “searchable”. Think of a Word document, where you will want to extract the text contained in the document, or an image that has some text that you want people to be able to search, or even an web page where you want to extract the title, the body and maybe some of its HTML metadata tags. Indexing: this is the magic sauce of search and what makes it different than just storing the content in a database and searching it using SQL statements. The content in a search engine is stored in a certain way optimized for later retrieval of this content. We typically call this optimized version of the content as the search index. Searching: the part of search engines most well known. You pass one or more query terms and the search engine will return results based on what is available in its search index. You’ll notice that there is one more component that we didn’t describe in our ‘basics’, but it’s quite an important one. The Analytics Processing Component is extremely important to SharePoint 2013 Search, as it does both Usage and Search Analytics and learns by usage and by processing various events such as ‘views’, ‘clicks’ and so on. It then enriches the index by updating index items, which impacts relevancy calculations based on processed data, and provides valuable information in such forms as Recommendations and Usage reports. Simply put, SharePoint 203 crawler grabs content from various repositories, runs it through various crawler rules and sends it off to Content Processing Components for further processing. You can think of it as an initial step for your feeding chain with search index being the final destination. Crawling can be scaled out using multiple crawl components and databases. New Continuous crawl mode ensures index freshness, while architecture has been simplified from FAST for SharePoint with having a single SharePoint Search Service Application handle both crawling and querying. A Continuous Crawl can have multiple continuous crawl sessions running in parallel. This capability enables crawler to keep Search Index fresher – for example if a preceding Continuous Crawl session is busy processing a deep security change, the subsequent crawl can process content updates. 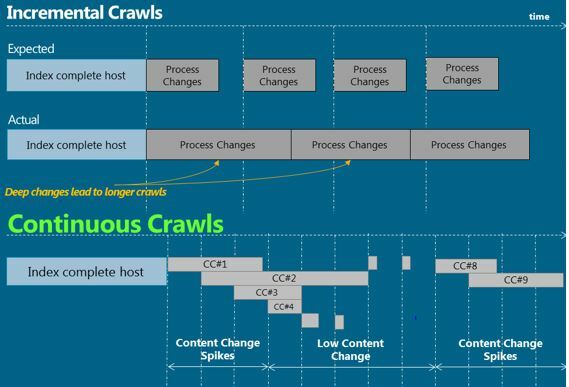 Unlike Incremental crawl, there is no longer a need to wait for completion before new changes can be picked up, these crawls are spun-up every 15 minutes and crawl the “change logs”. 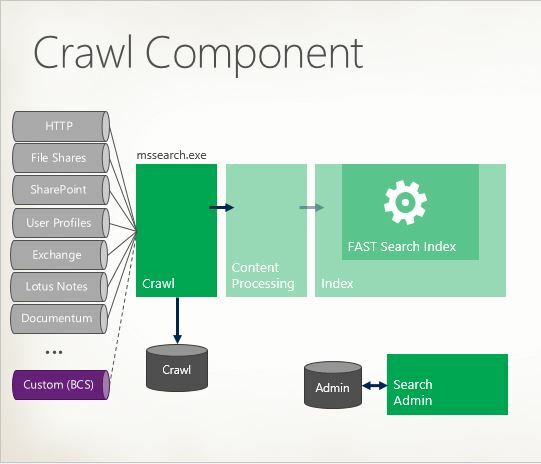 In SharePoint Search 2010, there was a single role involved in the feeding chain: the Crawler. In FAST for SharePoint 2010, feeding chain consisted of 3 additional components(other than the crawler): Content Distributor, Document Processor and Indexing Dispatcher. 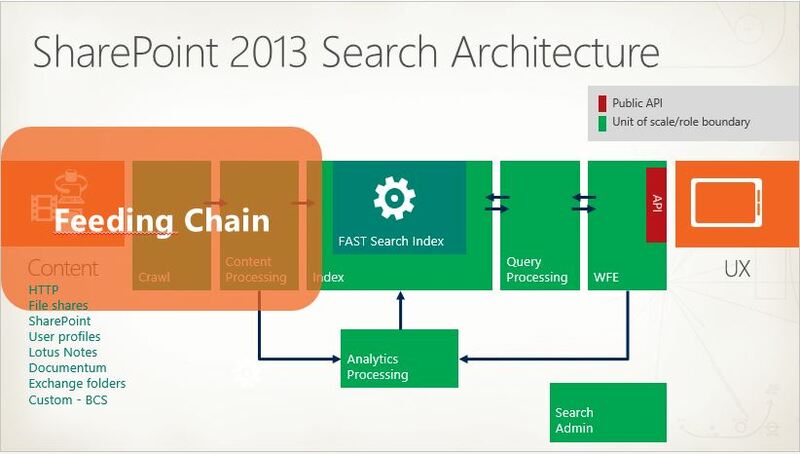 With SharePoint 2013 Search, Content Processing Component combines all three. A simple way to described Content Processing Component is that it takes the content produced by the Crawler, does some analysis/processing on the content to prepare it for indexing and sends it off to the Indexing Component. It takes crawled properties as input from the Crawler and produces output in terms of Managed Properties for the Indexer. Content Processing Component uses Flows and Operators to process the content. If coming from FAST “world”, think of Flows as Pipelines and Operators as Stages. Flows define how to process content, queries and results and each flow processes 1 item at a time. Flows consist of operators and connections organized as graphs. This is really where all the “magic” happens, things like language detection, word breaking, security descriptors, content enrichment(web service callout), entity and metadata extraction, deep link extraction and so on. CPC comes with pre-defined flows and operators that currently cannot be changed in a supported way. If you search hard enough, you will find blogs that will described how to customize flows and operators in an unsupported fashion. The flow has branches that handle different operations, like inserts, deletes and partial updates. Notice that security descriptors are now updated in a separate flow, which should make the dreaded “security-only” crawl perform better as opposed to previous versions. As I’ve mentioned, CPC has an internal mechanism to load-balance items coming from the Crawler between available flows(analogy to the old FAST Content Distributor). It also has a mechanism at the very end of the flow to load-balance indexing across the available Indexing Components(analogy to the old FAST Indexing Dispatcher). We will revisit this topic in more detail in subsequent posts. Web Service callout only works on managed properties and not on crawled properties, as was done with Pipeline Extensibility in FAST for SharePoint 2010. Flows have different branches that can handle operations like deletes or partial updates on security descriptors separately from main content, improving performance. Note: If Content Enrichment Web Service does not meet your current needs and you need more of an ESP-style functionality when it comes to pipeline customization, talk to Microsoft Consulting Services or Microsoft Premier Field Engineers regarding CEWS Pipeline Toolkit. Job of the indexer is to receive all processed content from Content Processing Component, eventually persist it to disk(store it) and have it ready to be searchable via Query Processing Component. It’s the “heart” of your search engine, this is where your crawled content lives. Your index will reside on a something called an Index Partition. You may have multiple Index Partitions, with each one containing a unique subset of the index. All of your Partitions taken together is your entire search index. Each Partition may have 1 or more Replicas, which will contain an exact copy of the index from that partition. There will always be at least one replica, meaning that one of your index partitions is also a primary replica. So when coming from FAST, think “partitions and replicas” instead of “columns and rows”. Each index replica an Index Component. 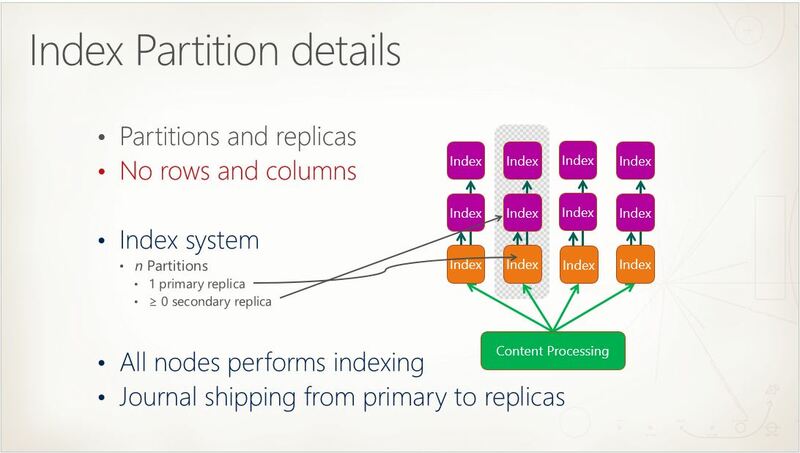 When we provision an Index Component, we associate with an index partition. – There is NO MORE FIXML. Just a reminder, FIXML stood for FAST Index XML and contained an XML representation of each document that the indexer used to create the binary index. FIXML was stored locally on disk and was frequently used to re-create binary index without have to re-feed from scratch. There is now a new mechanism called a ‘partial update’, which replaces the need for FIXML. – Instant Indexing: We can now serve queries much quicker directly from memory instead of waiting for them to be persisted to disk. – Journaling: Think RDBMS “transaction log”, a sequential history of all operations to each index partition and its replicas. Together with checkpointing, allows for “instant indexing” feature above , as well as ACID features (atomicity, consistency, isolation and durability). For the end-user, this ensures that a full document or set of documents as a group is either fully indexed or not indexed at all. We will discuss this in much more detail in subsequent posts. – Update Groups/Partial Update Mechanism: All document properties(managed properties) are split into Update Groups. In the past with FAST, “partial updates” where quite expensive as indexer would have read the whole FIXML document, find the element, update the file, save it and re-index the FIXML document. Now, properties in a one update group can be updated at a low cost without affecting the rest of the index. 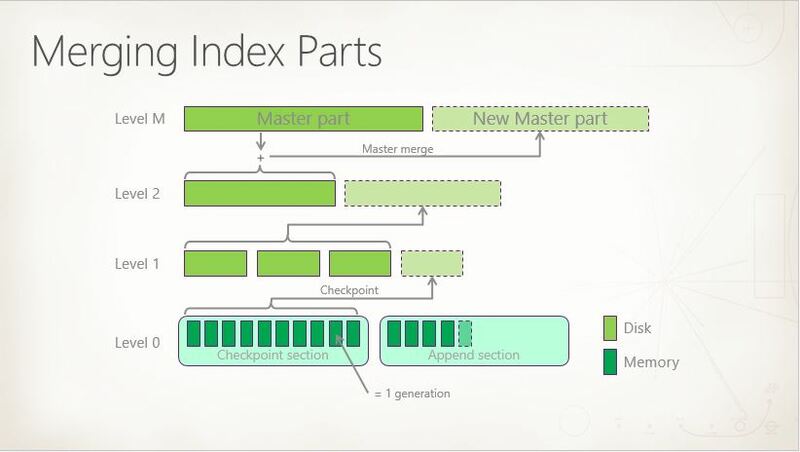 There is also an updated mechanism to merging Index Parts, which you can somewhat compare to how FAST handled what was then called “index partitions” in the past and merged them. Index internally is built up of several smaller inverted index parts, each one being an independent portion of the index. From time to time, based on specific criteria, they need to be merged in order to free up resources associated with maintaining many small indices. Typically, smaller ones will be merged more often while larger ones will be done less frequently. Checkpoint section contains document that are in memory but have not yet been persisted to disk, yet searchable. If search crashes, the in-memory portion will be lost but will be restored/replayed from the Journal on the next start up. Query Processing Component is tasked with taking a user query that comes from a search front-end and submits it to the Index Component. It routes incoming queries to index replicas, one from each index partition. Results are returned as a result set based on the processed query back to the QPC, which in turn processes the result set prior to sending it back to the search front-end. It also contains a set of flows and operators, similar to the Content Processing Component. If coming from FAST, you can compare it to the QRServer with its Query Processing Pipelines and stages. Analytics Processing Component is a powerful component that allows for features such as Recommendations(‘if you like this you might like that’), anchor text/link analysis and much more. It extracts both search analytics and usage analytics, analyzes all the data and returns the data in various forms, such as via reporting or by sending it to Content Processing Component to be included in the search index for improved relevance calculations and recall. – Search analytics is information such as links, anchor text, information related to people, metadata, click distance, social distance, etc. from items that APC receives via the Content Processing Component and stores the information in the Link database. – Usage analytics is information such as the number of times an item is viewed from the front-end event store and is stored in the Analytics Reporting database. Based on Map/Reduce framework – workers execute needed tasks. 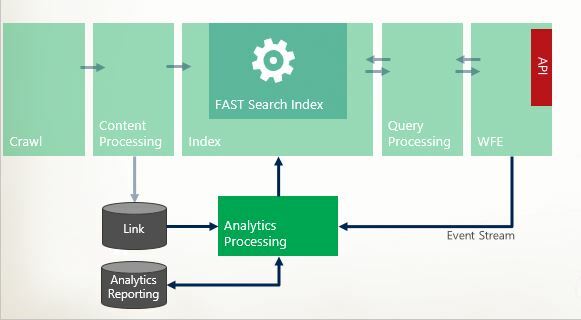 Coming from FAST ESP/FAST for SharePoint, it combines many separate features and components such as FAST Recommendations, WebAnalyzer, Click-through analysis into a single component…and adds more. I hope to be able to do some deep-dives into each component in future posts, feel free to drop me a note with any questions that may come up.